Welcome aboard! 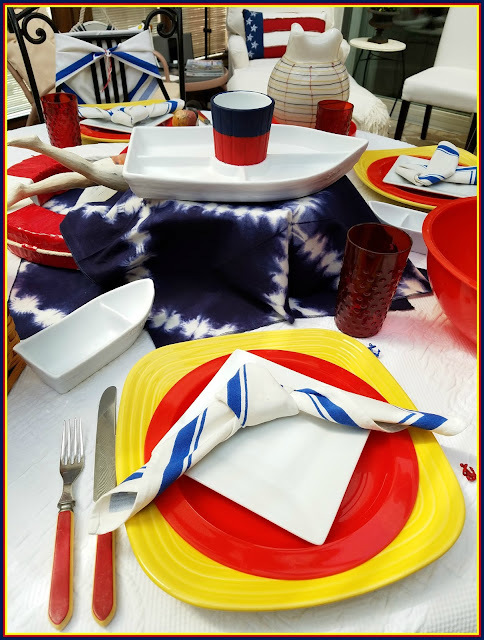 Here at Panoply, tablescaping - particularly with vintage finds - is one of my favorite topics! It's nearly summer - in fact, the unofficial start of summer is this Memorial weekend. Summertime...where the livin' is easy, and anything goes. 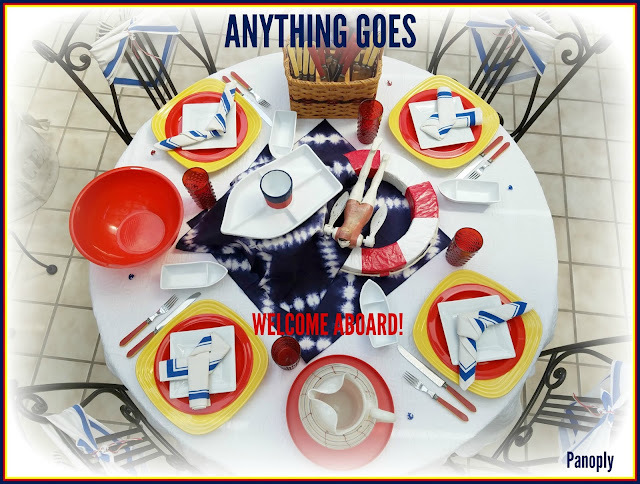 As we approach celebrating the 2017 Tony Awards, today's tablescaping theme is centered around the Broadway musical, Anything Goes**. When Chloe Crabtree from Celebrate and Decorate invited me to participate in a Broadway themed tablescape party, I initially declined, overwhelmed with remodeling our master bath. Thank goodness that project ended (whoot! whoot! ), and I had some things on hand that sparked some inspiration. 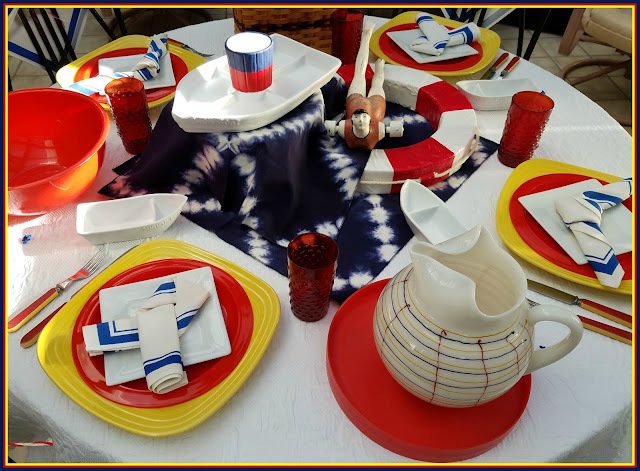 The vintage pitcher and retro-cool picnic ensemble pictured below were the springboard items which had me deciding to "dive" into the party! With a few more vintage supplies also on hand, my interpretation of the 1934 musical Anything Goes, featuring music and lyrics by Cole Porter, flowed easily. The S.S. American is sailing between New York and England with a cast of passengers sure to make you smile. The table is set for a quick brunch or light lunch in my sunroom. 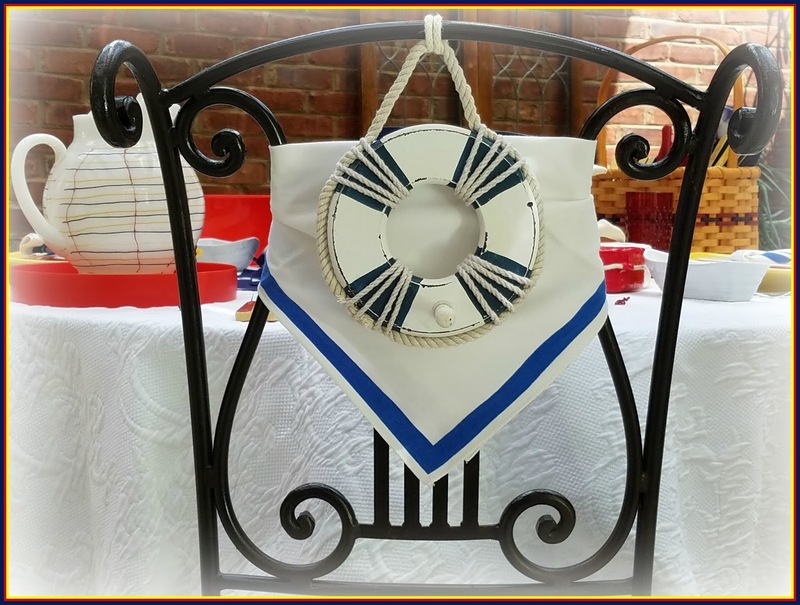 Let's tie a sailor's knot [napkin] and sail, shall we? 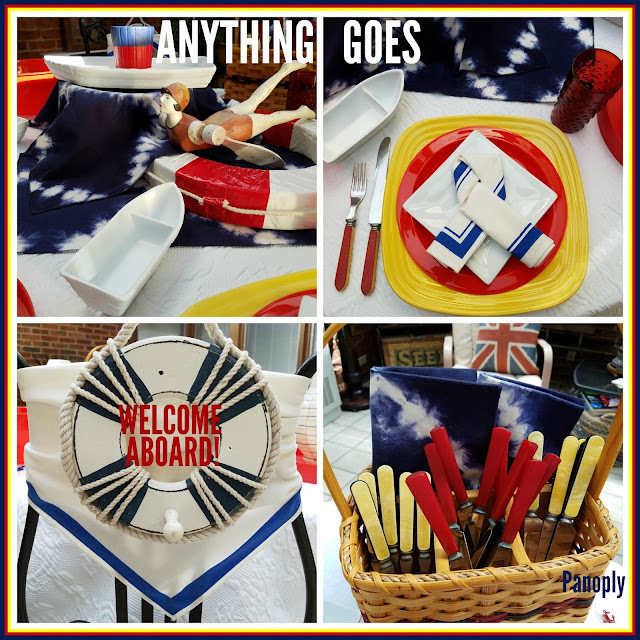 As the plot of Anything Goes unfolds on an ocean liner crossing from the US to the UK, I thought it fitting to bring out my US flag and Union Jack pillow covers to use as accents in the sunroom, seen in the background of the photos above and below. 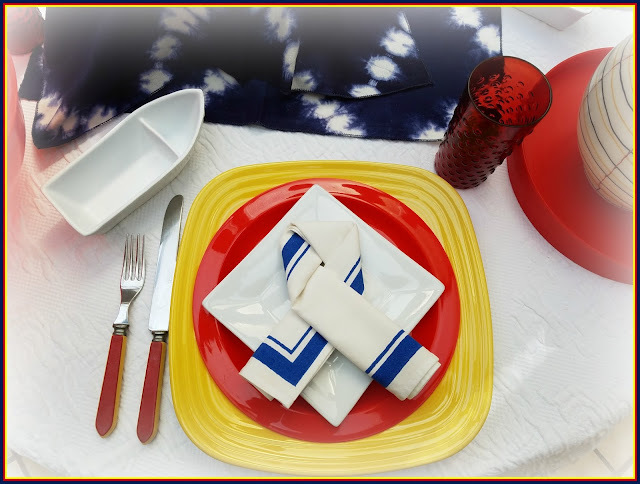 The place setting stack consists of a yellow Fiestaware® square dinner plate, vintage red picnic plate (from the picnic set), and a square white appetizer plate (Crate and Barrel). 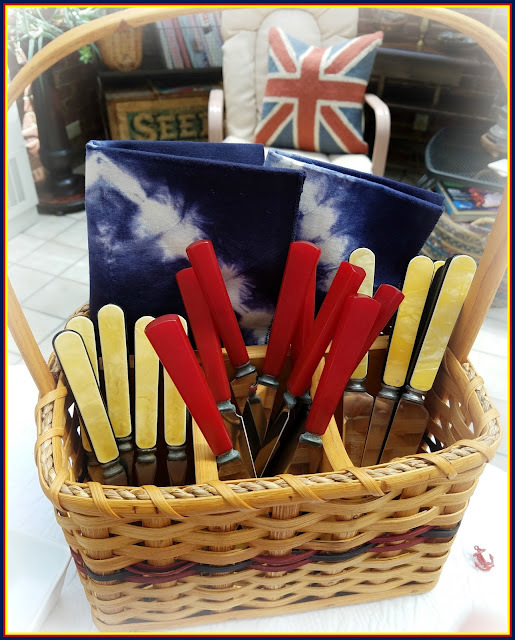 Collected bakelite flatware in red and navy, with a touch of mellowed yellow (originally ivorine) trim, were used on the tabletop. Extra utensils were garnered in an Amish-made wicker caddy sourced in Ohio several years ago. 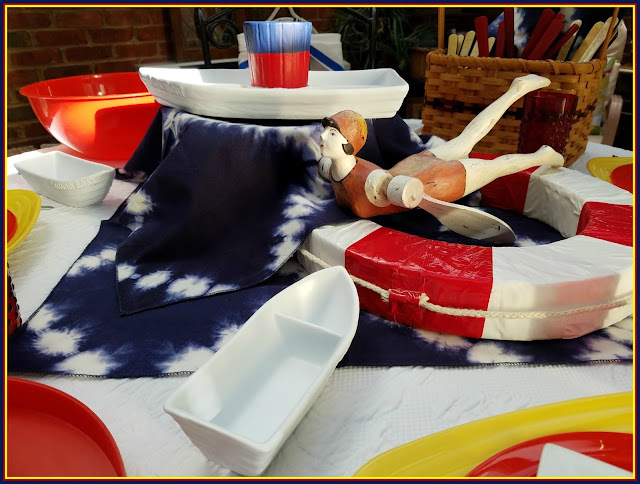 A 'show boat' is elevated on a cake pedestal used as a riser (pictured below), covered with tie-dyed indigo napkins (Sundance Outlet), evoking the ocean's deep waters and waves. Mini 'shrimp boats', reminiscent of the small boats that take cruise passengers to port excursions, are part of the vintage service set, and rest at each guest's place setting. The service set could be for shrimp, veggies, fruit, or other menu items for this gathering. 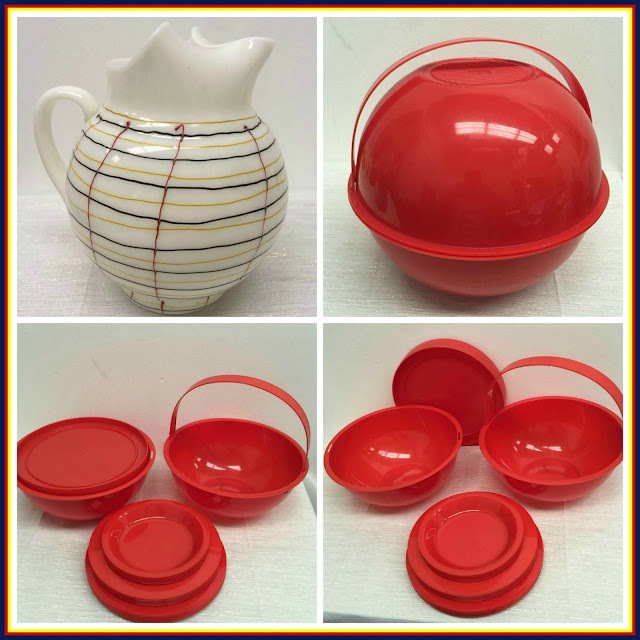 Each of the bottom and top (lids) of the vintage picnic set can be used as bowls for service, one of which is on the table (below). 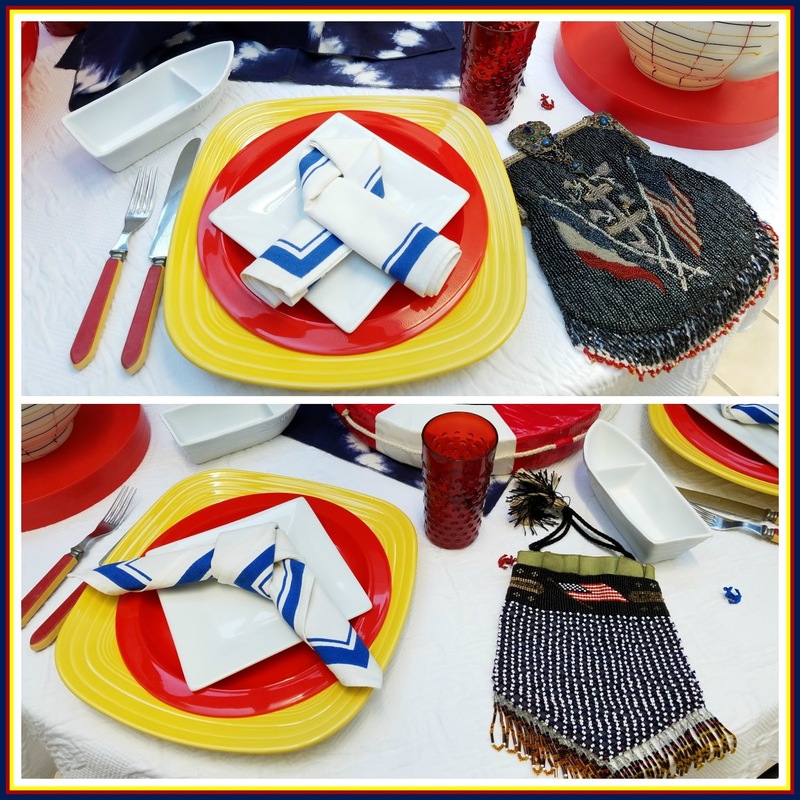 Vintage cotton duck napkins were used at each place setting, both on the chair backs and at the plate service. What could be better than a love triangle storyline (besides napkins folded in a love knot?). I'll tell you what could be better than a love triangle storyline. A love triangle storyline that takes place during the Art Deco era - this self-proclaimed Flapper girl's favorite era! For this occasion, I brought out a couple of my favorite, authentically Art Deco, beaded handbags from my personal antique and vintage purse collection - those with a patriotic twist! 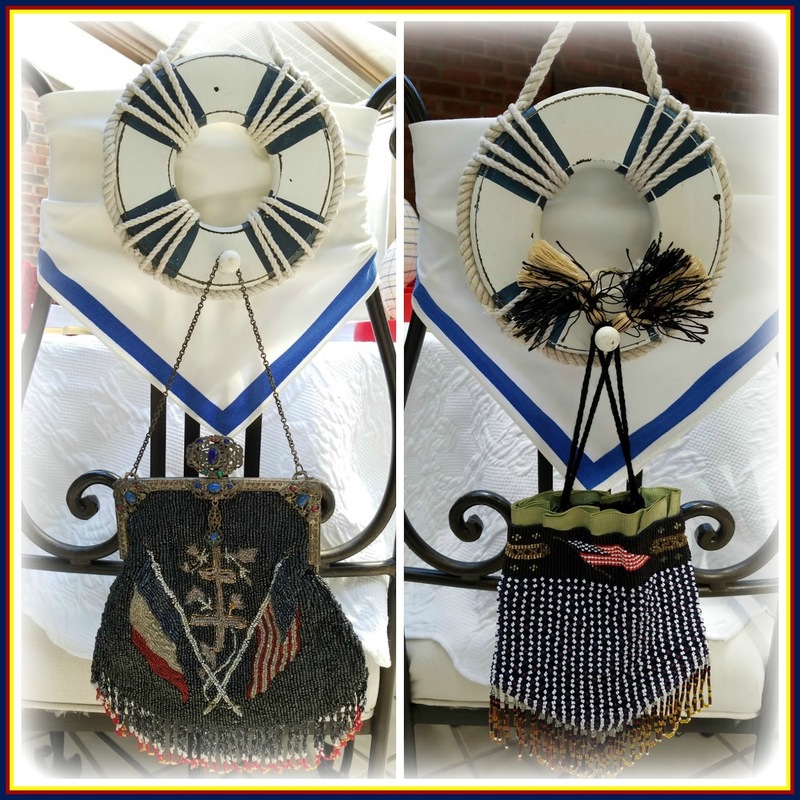 The one pictured below (left) was a WWI handbag, lovingly restored. The one on the right was procured from a fellow collector friend. The chair back life buoy decor (Hobby Lobby) makes the perfect place to hang the Art Deco handbags when the purses might otherwise obstruct the passing of foodstuffs on the table. The red hobnob glasses are also from my vintage stash and, together with the great bulbous pitcher, might just be the perfect combo for some Bloody Marys or Red Eyes, depending on the guests' night before. ;) The tiny anchors scattered on the table are actually little buttons I had, added for more whimsy. Rounding out the table centerpiece is my Deco-era, bathing beauty whirligig, set within the red and white life preserver. 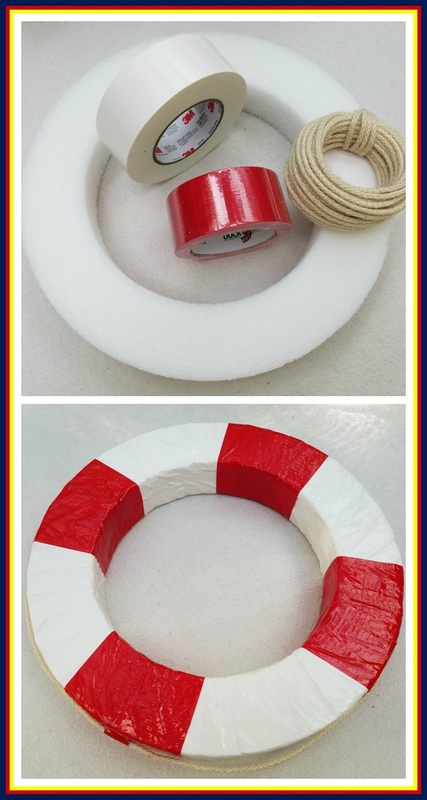 Just to show how easily this centerpiece was pulled together, I reached for a few basic craft supplies: a foam wreath, red and white duct tape, and natural, hemp rope. Simple! I hope you found this tablescape whimsically inspiring, whether the theme be for the Broadway musical Anything Goes, #MemorialDay, or any other nautical and/or summertime fun fete. Feel free to browse my topics on the menu bar at the top of my blog and, if you find similar interests, I invite your return. You can also sign up for posts to be emailed directly to your inbox. Regardless, I appreciate your visit today and welcome your comments. 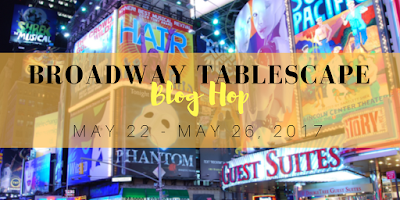 This week I am joining all the bloggers conveniently listed below, where you can simply click on any - or all - to see a whole lot of award-winning Broadway tablescapes. A heartfelt thank you to Chloe from the blog Celebrate and Decorate for organizing and hosting this roundup! Terrific Cole Porter songs such as "It's De-Lovely", "I Get a Kick Out of You", "Anything Goes", and "Let's Misbehave" are just a few classics from the Broadway comedy Anything Goes that takes place on the high seas during the luxurious and progressive days of the Art Deco period. Farcical antics abound in this musical. During the 1930s, it was the 4th longest running Broadway musical, despite the Great Depression. It has been revived numerous times on Broadway and in civic theater. In 1987, it won the Tony award for best revival of a musical, best actor, and best choreography. Reno Sweeney, a popular nightclub singer and former evangelist is just one character on board this ship. Her pal, Billy Crocker, a lovelorn Wall Street broker, has come on board to try to win the heart of Hope Harcourt, who is engaged to another passenger, wealthy Lord Evelyn Oakleigh. Of course, there's Public Enemy #13 - Moonface Martin - who, in the end, not only manages to help Billy win the love of his life, but also manages to be declared harmless as a public enemy.